Some artists express their creativity using paint, pencil, and clay. Peggy Shannon’s media of choice is shortbread. When you first lay eyes on a shortbread cookie from Queen City Cookies, it’s hard to imagine eating it. It seems too precious to disturb the painstakingly rendered details. But Peggy, a lifelong baker, wants her artistry to be experienced with the palate as well as the eyes. So we obliged, and discovered the flavor and texture of these cookies is every bit as luscious as the detailing. The inspiration for Queen City Cookies is Springerle, a traditional German treat that’s made using hand-carved molds to imprint designs into cookies. 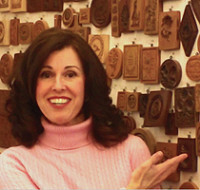 Peggy was taken by the intricate Springerle molds, some of which date back to the 14th century, and she started her own collection of cookie molds. The imagery -- love birds, hearts, flora and fauna -- is traditional, but Peggy’s approach to taste and texture is modern. She starts with crisp shortbread then adorns it with a soft icing top that’s hand-pressed with a design from her cookie molds. Each crispy, buttery cookie is a work of art, handmade to order with premium, preservative-free ingredients including farm-fresh eggs, whole cane sugar and European-style butter. It’s hard to decide which is more exquisite, the look of these stunning cookies or their rich, delicious taste. We’ll happily call it a tie and savor every detail, every last bite. Hi! My name is Peggy Shannon and I’m the owner of Queen City Cookies. We’re a small boutique bakery located in Cincinnati, Ohio. Queen City Cookies is known for made to order, hand-crafted premium works of edible art. Although we have a lot of fun creating magic in our bakery each day, we take making each batch of all-natural shortbread quite seriously. Our cookies are made using the highest caliber ingredients, like European style rich Plugrá butter, farm fresh eggs, and pure cane sugar. We believe you can taste the difference in each bite of Queen City Cookies buttery shortbread bliss. And, our attention to detail in our exquisite packaging is second to none. It’s over the top luxury, designed to delight and pamper you! Each cookie we make is truly an original work of edible art. Our crisp, buttery shortbread is cut by hand, then adorned with a soft icing imprinted with one of our 500+ antique molds. 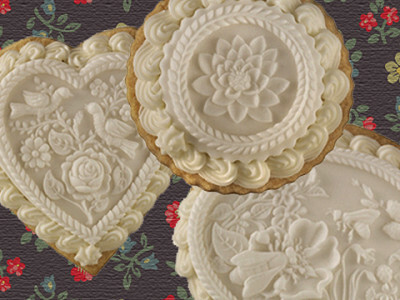 Finally, one of our bakery artisans trims each cookie with decorative piping. We’ve selected our finest cookies for you to enjoy on Daily Grommet. We hope you enjoy them as much as we do. I can’t wait to share our story and cookies with you on Daily Grommet! Just don’t say they’re too pretty to eat! Sure, they’re beautiful, but they taste as good as they look! Are your cookies kosher parve? @Jo King: Hi, Jo! Big regrets, no. The shortbread bottom is kosher on it's own, but the icing top isn't kosher. We tried finding another icing to work with that would be kosher, but to date we haven't found one that would hold the imprints. I'm sorry, as kosher certification is important to us. Would you be interested in making cookies to give as wedding favors? They are stunning and would be most suitable for the theme of the wedding. It would be a larger order and I noted that you had stated, smaller orders? How much would the cost be for about 6 or 7 dozen? @Jennifer: We love working with weddings, but as each cookie is made by hand, we don't offer price reductions on the cookies. The cost depends on the size of the cookie. The collections on the Grommet are a great place to start for a range. Is there a way to request delivery closer to Valentine's Day? Your cookies look amazing, btw! @Becky: Your Valentine will swoon over these treat! The lovely Grommet folks can help with making your delivery perfect. Just indicate hold for Valentine's delivery on your order! Ohhhs and ahhhs guaranteed! @Becky: When you are placing your order use the Gift Message box to indicate that you need the order held for a Valentine's Day delivery. Peggy, I realize that the icing isn't kosher. Does it have lard? @Mindy: No lard, just extra butter and lots of love! ADORABLE!! My mouth is watering just hearing and reading the words based on the ingredients you use. Question: the price for a cookie card I noticed was 34.$ is that for four? What is the difference in what you receive from that one versus the ones that are for $36 dollars (i.e. ; love one). correction(SORRY!! ): the cookie four count shows $32 and the themed ones show $34. What is the difference and how many cookies do you receive if you don't order the cookie card? Additionally, can I order cookie cards with the "love theme?" How are the cookies packaged and shipped? May I purchase a cookie and could you ship it directly to a different recipient writing the message on the cookie card on your own? @CHITOWN MOMMY: Hi, Chittown Mommy! I'm thrilled you're enjoying these edible works of art. There's a couple differences between the two sets. The set of cards come with 4 cookies, all of which are affixed to a gold foiled card greeting card that has room for a personal greeting on the inside. It comes complete with an organza gift bag for each cookie. The images in the collection include: (Large) Spring Buds and Bees, (Large)Lovebirds, (Med.) Divine Lotus and a (Med.) Regal Elephant. This is the ONLY collection that comes only the decorative greeting cards. The love themed collection includes more cookies, but these come in cello bags with hang tags. The cookie cards are a little more, as the adorable greeting cards and gift bags are included, where they are not with the other collections. We'd be delighted to customize any message you'd like to send, and include for you at no charge. Simply create a second order with the Grommet for your friend, and we can take care of the rest! @CHITOWN MOMMY: I realized I didn't respond to your packaging and shipping question. I have actually tried to respond 2x and my message disappeared! Lucky I am better at cookies than typing! If you look at the card collection online @Daily Grommet you will see a hint of our periwinkle gift box. It's adorable with a scalloped front that is trimmed to resemble a dollie, and has a resealable velco tab. Inside the cookies are nestled in two different, yet coordinated sheets of tissue. Each box contains a hand written note of gratitude or inspiration, along with our fun elephant cards, each with an uplifiting quote or saying. But wait there's more! We then place your gift box in a cloud of starch peanuts (take them outside and they melt!) to carry your gift to its desination. We seal the box with our custom navy printed sealing tape that has a brocade print, and says handle gently, elephant on board! Not to worry, our elephant printed on the tape will watch over your package to its destination. We then hand write the address on our 5 color mailing label, and for extra fun, add one of our gold foiled stickers to the top for extra delight! All this love is hand carried to your door by UPS. Wow! Imagine how good the cookies are if we go to this much attention for shipping! Excited to share Queen City Cookies with each of you! Thanks so much for your questions! We're here to please, so let us know how we can sweeten your day! I would love to try these cookies as they are beautiful but the shipping cost is astronomical. Is there a chance these are available at any high end stores as a Nordstroms or Neiman Marcus? I don't necessarily shop there but would if I could purchase these closer to home. @BD: Hi, BD! I am not sure where you live, but do hope you try the cookies from Daily Grommet. We've arranged special pricing with them to allow cookie connoisseurs like yourself the option to try something new and delicious. I can suggest a couple stores similar to Neimans, but the cookies are a bit higher than you'll find here. Most sites too mandate 2 day shipping for food, which can run as high as $25 and up. If you take a look above at the level of quality and attention to detail that goes into each shipping box, I think the shipping cost is almost too low. The cost of shipping each box is over $10, the shipping box over a $1 and then, we pay people good wages to work so they can make a living. I agree shipping in general is out of control and I wish that we could offer lower rates! We put the cost of the box and all of its love into the shipping, instead of the cookie price, hoping that would even out--especially since the entire experience from product to package is designed to pamper you! @BD: double forgot :) Daily Grommet worked hard to keep the cost of the shipping down, and looked at ground shipping, so their guests weren't forced into the high price of 2 day--or even next day-- shipping that some sites force upon their customers who order food. And, small artisan bakeries and such don't have the clout massive chain stores do to secure super low rates, like mega retailers like WalMart and Amazon. So, Yay, Daily Grommet for allowing small bakeries the room to serve your guests! How long will the cookies remain fresh? @Cherry: Queen City recommends that you eat them within 2 weeks, but they will remain fresh for six weeks at which time the cookie will still be delicious but the frosting will become less tender. They shouldn't be stored in a freezer. @Cherry: Hi, Cherry! Everyone wants that just baked freshness and we take great care in making sure each cokie arrives as fresh as possible! One of the ways we do that is we make each cookie to order. Since we pride ourselves in using only the finest quality ingredients and want no preservatives in our products--or bodies--the cookies are free of anything that is not natural. Therefore, the cookies are good for around six week, but are great just under a month. I'm fairly close to you (in Columbus, OH). Would it be possible to order six of the lighthouse decorated cookies as a Valentine gift for my boyfriend, or do I have to purchase the entire nautical set? I'm willing to make a trip to your shop if need be. Thanks! @Dawn: Hello my fellow Buckeye! Of course, the entire set makes an amazing gift -- the folks at the Daily Grommet have done a wonderful job of picking out the best collection of our cookies. If you prefer just lighthouses, I'm sure that can be arranged. And remember, they taste great with Jeni's Ice Cream! I was truly delighted when I saw these beautiful cookies that I am building a tea party around them. My father passed away in December and he and my mother would have celebrated thirty-one years of marriage on Valentine's Day. I am going to host a tea party for Mom and some of her friends who helped us through this difficult time. Looking forward to having your cookies grace our table on a truly special day for our family. @Dena Cordes: Dena, I am so sorry for your loss. That's always hard, and really awful during the holiday season. What a wonderful way to express your love for him, and create what I hope will be a new tradition with your mother. I can't wait to hear how the blessing unfolds during this special Valentine's Day. Pictures please! And thank you for allowing us to be part of the magic! Do you do baby themed cookies? I'm having a baby shower on March 17 and have been trying to find something unusual & these are stunning! @Laura: How fun, Laura! We love baby showers! The love collection here on the Grommet would be a great choice. There's also many wonderful images with babies on our site. Let us know how we can help! And please, send congrats our way!! Absolutely beautiful cookies! They are works of art. @ Yvette: Thank you for stopping by to share your experience. The cookies are indeed gorgeous. Some artists express their creativity using paint, pencil, and clay. Peggy Shannon’s media of choice is shortbread. When you first lay eyes on a shortbread cookie from Queen City Cookies, it’s hard to imagine eating it. It seems too precious to disturb the painstakingly rendered details. But Peggy, a lifelong baker, wants her artistry to be experienced with the palate as well as the eyes. So we obliged, and discovered the flavor and texture of these cookies is every bit as luscious as the detailing. The inspiration for Queen City Cookies is Springerle, a traditional German treat that’s made using hand-carved molds to imprint designs into cookies. Peggy was taken by the intricate Springerle molds, some of which date back to the 14th century, and she started her own collection of cookie molds. The imagery -- love birds, hearts, flora and fauna -- is traditional, but Peggy’s approach to taste and texture is modern. 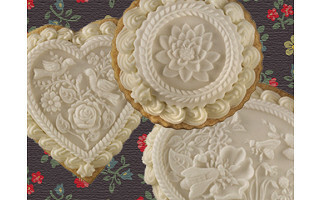 She starts with crisp shortbread then adorns it with a soft icing top that’s hand-pressed with a design from her cookie molds. Each crispy, buttery cookie is a work of art, handmade to order with premium, preservative-free ingredients including farm-fresh eggs, whole cane sugar and European-style butter.